Some of the most prolific prospects for petroleum world-wide. Wrench faults and associated arcuate fold structures distributed among sets of structures in a zone, parallel to and over basement strike-slip faults, are some of the most prolific prospects for petroleum world-wide. Strike–slip faulting is a common mode of deformation in both continental and oceanic crust, occurring at a wide range of scales in relatively narrow and subvertical wrench zones along which two adjacent blocks move sideways, parallel to the strike of the fault zone. At depth strike slip zones become ductile shear zones characterised by vertical foliation and a horizontal stretching lineation (e.g. the South Armorican Shear Zone). They can be several kilometres wide. Strike slip and wrench fault systems are broadly equivalent, though their specific plate tectonic settings are variable. They typically involve basement. En echelon structures which may trap oil and gas develop in a systematic pattern along wrench zones in sedimentary basins. Oblique movements of fault blocks on opposite sides of a wrench fault cause divergence or convergence and enhancement, respectively, of extensional or compressional structures. Basins form in areas of extension and are filled with sediment, whereas upthrust blocks emerge in areas of compression and become sediment sources. Wrench faulting in a petroliferous basin leads to increase prospects for major hydrocarbon reserves. Wrench faults are commonly segmented at all scales and levels of exposure, typically in the form of en échelon, non-coplanar faults separated by offsets (or step-overs). These step-over zones of host rock between the end and the beginning of two adjoining en échelon shear fractures deform in order to accommodate continued strike slip displacement. This local deformation may lead to the formation of short fault segments that connect adjacent en échelon fault segments and result in a through-going fault zone. The geometry of these step-over zones and linking faults, in turn, controls contractional or extensional deformation according to the sense of slip and stepping direction of the en échelon fault segments. The interaction of three factors results in several different predictable patterns of petroleum traps related to wrench faults: the evolutionary stage or magnitude of the wrench faults; the configurations of the laterally moving plates and their orientations to regional movement vectors; and the structural response of the deformed terrane. In the more common fold and fault responses, small displacements along wrench faults develop narrow trends of en echelon anticlinal culminations which straddle an incipient or underlying wrench fault. Eslan scientists have reconstructed the Phanerozoic tectonic, litho-stratigraphic, and geophysical history of the wrench faults of the Levant region. This has important implications for eastern Mediterranean prospect strategies for hydrocarbon exploration, in particular those related to the wrench faults and thin-skinned tectonics. Dead Sea sinistral transform fault accommodating differential northward motion of the Arabian plate created by the opening of the Red Sea, with associated pull-apart basins, and genetically associated thin-skinned tectonics of the Palmyride fold and thrust belt extending from Sinai, through the states of Egypt, Israel, Lebanon, and Syria. The Dead Sea transform fault system exhibits significant variation in structural style northwards along strike, attributed to variation in coupling between basement and cover, due to variation along the strike slip fault system and to basement-involved extension. Deformation in the southern Sinai and Arabian shield is dominated by transtensional graben that accommodate extension in the basement orthogonal to the major strike slip fault. Northwards, along the strike slip fault, a system of en-echelon folds-thrusts extends in an arcuate transpressional-transtensional belt from Egypt’s Western Desert through Sinai, the Levant of Israel and Lebanon into Syria. Wrench faults are a common mode of deformation, occurring at a wide range of scales in relatively narrow and subvertical zones of wrench faults along which two adjacent blocks move sideways, parallel to the strike of the fault zone. Wrench faults typically involve basement. Eslan Labs specializes in building rapid, cost effective interpretations from gravity and magnetic data. En echelon structures which may trap oil and gas develop in a systematic pattern along zones of wrench faults in sedimentary basins. At depth, zones of wrench faults become ductile shear zones characterised by vertical foliation and a horizontal stretching lineation. They can be several kilometres wide. Oblique movements of fault blocks on opposite sides of wrench faults cause divergence or convergence and enhancement, respectively, of extensional or compressional structures. En echelon arcuate folds form above the zone of wrench faults, and are distributed in a broad zones of wrench faults-shears above or adjacent to the associated wrench faults. They receive attention from the petroleum industry, because they are productive traps. The axes of such folds in the sedimentary cover over zones of basement wrench faults/shear zones are typically arranged along trends that make an acute angle with the approximately parallel fault. In the simplest case, the axial traces of en echelon folds make an angle of 45° in plan view to the shear direction representing the shortening component of the finite strain, but trends of folds vary from less than 10° to 45° to the strike of the fault zone. Early in the deformation history, an en echelon array of folds with axial traces at about 45 degrees to the strike slip fault trace form. Folds extend progressively from the principal displacement zone with increasing displacement over time. The largest amplitude folds are near the principle zone of wrench faults, and the most recent folds are farthest from the strike slip fault at the margins of the deformation zone, and can result in a zone of deformation as wide as 100 km or more. 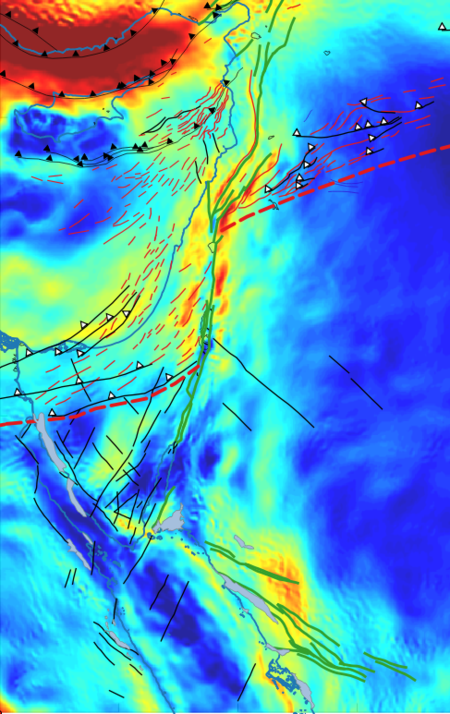 The zone of recent strike slip is narrow, but the zone of shear is wide and heterogeneous over time. Folds associated with wrench faults are typically arranged spatially such that culminations and depressions in successive folds lie along lines that make an acute angle with the approximately parallel fold axes. Such en échelon folding reveals the relative sense of movement on the wrench faults or shear zones. Many wrench faults have been interpreted to show upward-branching form on seismic profiles, denoted “positive” or “negative” on the basis of whether the units within it are arched by reverse components of displacement or dropped by normal separations. This type of complexity is common along wrench faults, and can create a variety of potential traps associated with wrench faults. In addition to anticlinal and fault-trap closures, shearing can generate fractures in surrounding competent lithologies. As temperature and pressure increase with depth, discrete planes and zones of brittle displacement along wrench faults in the upper crust change into wider zones of ductile displacement in the lower crust and rocks flow by ductile creep. Shear strain intensity is low in the wall rock, increases across the gradients and is highest at the plane between both gradients. This ductile faulting is an extreme end member of a ductile to brittle series, and like the other extreme end member, brittle fault zones, contains smaller-scale structures indicating the sense of shear. Typically, strain gradients are continuous and anti-symmetrical from the shear zone walls to the medial, highest strain plane with the sides differing in shape and size. The sense of relative displacement can be inferred from the curved shape of the new shear foliation and from deflected pre-existing markers. Strain distribution and symmetrical displacement profiles are indicators of shear zones where a shearing couple instigates progressive rotation and flattening. Displacements are parallel to the shear sense, parallel to the walls of the shear zone. Ductile rocks obey the Von Mises failure criterion, the horizontal part of the failure envelope in a Mohr diagram where the shear zone initiates at 45° to σ1 and contains an initial foliation developing perpendicular to σ1. This means that at any given stage during simple shear, the instantaneous plane of flattening is at 45° to the shear zone. Therefore, the occurrence of the new shear foliation along the walls of a shear zone is always formed at 45° to the shear zone boundary, with the inclination of foliation to shear zone consistent with the sense of shear. Thus, θ’ decreases with increasing shear strain meaning that foliation is progressively curved from 45° at the margins (where γ = 0) to near parallelism to the shear zone boundaries within the zone center. This is because, in simple shear, one line of no finite longitudinal strain is parallel to the shear direction (i.e. the shear zone boundaries, or the medial central fault). Deformation localizes into narrow zones of intense shearing separated by low deformation regions. Under intense shear, the bulk flow plane is parallel to the average foliation and the shear of the flow is parallel to the lineation. For ductile shear zones, it is important to determine the orientation of the displacement vector and the sense of shear; although it is often difficult to measure the magnitude of the displacement because of uncertainties in shear strain assessment where foliation is sub-parallel to shear plane (i.e. for γ>10). A detailed analysis of kinematic indicators from a shear zone involves recording many kinematic observations at all scales. Shear zones with defined sense of shear accept the same terminology as for faults, normal, thrust, strike-slip, etc. The gradual deflection of a planar, pre-existing marker such as a vein, a dyke or an old foliation initially oblique to the shear zone is often a direct reflection of the sense of relative displacement within the shear zone. The systematic, sigmoidal curvature of the shear foliation across shear zones is the most direct sense of shear indicator. The simple shear foliation curves in the sense of shear and turns from about 45° along the shear zone boundaries towards parallelism to the shear zone boundaries in the central mylonite. In the Levant, the basement is competent compared with overlying sediments, and so the cover is mechanically detached from the basement along basal detachment faults and involved in complex faulting and folding not shared by the underlying basement in a thin-skinned tectonics regime.